Chikungunya is a viral disease resulting from carrier mosquito bites and has been making frequent headlines lately in South Asian countries, namely in India and Bangladesh. In 2016, there were 64,057 reports of chikungunya infections in India, a whopping 340% escalation compared to the statistics from 2013. In Bangladesh, the Institute of Epidemiology, Disease Control and Research (IEDCR) has forecasted that about 10% of the population in the country’s densely populated capital Dhaka are at risk of being infected by the virus, which accounts for 1.8 million people. Chikungunya is not a lethal disease, but it can cause some serious pain and high fever, especially to younger patients. As children are fond of playing outside, they are highly susceptible to mosquito bites and mosquito borne diseases like chikungunya. Chikungunya is endemic in Asia and Africa and has triggered multiple epidemics in these regions over the years. Outbreaks of the disease were also reported in the US, Australia, and Europe but it remains dominant in Asian and African territories. The first reported victims of the virus were found in Tanzania just a few years after the end of World War II. Aedes aegypti and Aedes albopictus are the species which serve as vectors of the chikungunya virus. The larvae of the virus get injected into the bloodstream of another living animal once the mosquitoes bite it, which later flourish into a mature stage. In case of human contractions, the patient begins to develop symptoms like skin rash, fever, and joint pain after an incubation period of 2-4 days. 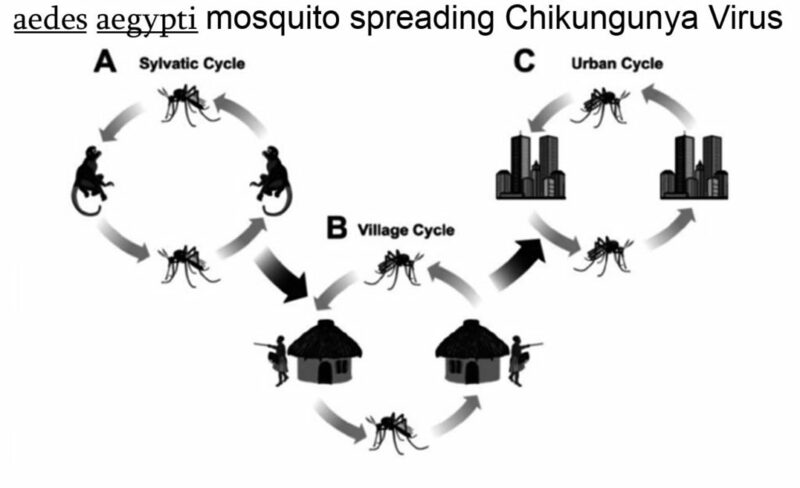 Chikungunya is a word derived from Kimakonde, a tribal language used in southeast Tanzania and northern Mozambique. It translates “to become bent”, referring to the posture of pain stricken patients. When the chikungunya virus enters the body, it targets the fibroblasts and epilithial cells in the body of the host. As soon as these cells get infected the virus starts begins its replication phase and gets carried into the bloodstream with circulatory white blood cells. Infants might contract the virus directly from their mothers if the mother contracts the disease within four days from delivery. It usually takes 2-12 days for the virus to compromise the host’s immune system and set off distinctive manifestations in the host body. The symptoms of the virus are almost the same in children and adults, but the symptoms are usually less severe in children, thanks to their stronger immune systems. Fever and joint pains are the most common symptoms detected in chikungunya patients, but in cases of younger patients, the joint pains are much more tolerable than adults. This happens because their joints in are still going through a development process, so the spells of arthritic pain are shorter in juvenile chikungunya patients. The virus also tends to attack larger bone joints in a child’s body, which also reduces the acuteness of pain. High fever lasting for 2-7 days. Gastrointestinal difficulties like nausea, stomachache, frequent bowel movements and stool discharges. Swollen and painful joints. Headaches and eye pain are also commonly seen. Red skin irritations resulting from burst blood vessels. The immune system burns extra calories to fight the virus so that the host might feel tired and exhausted. If your child shows any of the above symptoms, you should consult a physician immediately. Even if your child displays all the relevant symptoms of chikungunya, doctors need a precise diagnosis before starting the treatment. The presence of IgM and IgG antibodies in patient’s blood samples confirms that the patient is suffering from chikungunya. Various serological and virological tests are available for tracing the presence of these antibodies. Rest: Make sure your child gets sufficient rest to ease off the stress and accelerate his/her recuperation. Rest is instrumental in reducing fatigue and re-energizing the body during the recovery phase. Fluids: The affected children need to take plenty of fluids to fight dehydration and support the recovery process. Besides water, you should also give fresh fruit juices to your child as their antioxidants avert cell damage and keep other detrimental infections at bay. Medications: Doctors would prescribe medications to soothe the pain and fever in children. Suitable doses of remedial drugs such as Ibuprofen, Paracetamol, Nabproxen, and Acetaminophen should be administered to kids with chikungunya infection. However, Ibuprofen should only be prescribed if doctors are 100% sure that the disease is chikungunya, not dengue. Dengue and chikungunya present similar symptoms, so a blood test needs to be done to detect chikungunya confirming antibodies. Ibuprofens are anti-inflammatories that deplete the platelet count in your bloodstream. Dengue is also responsible for reduced amounts of platelets. Therefore the consequences would be disastrous if Ibuprofen is prescribed without the ruling out the possibility of dengue fever. Aspirins should also be avoided. Prevent further mosquito bites: Use mosquito repellents and take other necessary measures to keep our child safe from more mosquito bites. Re-entrance of the virus in the patient’s bloodstream would complicate the healing process by substantial degrees. Don’t let your children play near pools of stagnant water. Stagnant water is the ideal place for mosquitoes to breed. Keep your surroundings clean. Make sure there is no standing water around your home. Use larvaecides in ornamental ponds. Dress your children in full sleeve clothing for reducing skin exposure. You can also use mosquito repellant products. Consult a dermatologist before using them. Darker color shades attract mosquitoes. So, avoid dark color clothing. Try to keep your house cool. Mosquitoes can’t survive colder temperatures. Air-conditioned households are guaranteed mosquito free zones. There has been a recent spike in the number of chikungunya infections worldwide. Chikungunya is no longer limited to its endemic regions in Asia and Africa; as of now, 60 countries in the world have reported human chikungunya contractions. The rapid increase in mosquito reproduction around the world has made Chikungunya a contemporary global concern. Therefore, we must take necessary preventive measures to save ourselves and our children from the danger of chikungunya.